Now, that is an interesting word! What does it mean to you? It can cover a lot of territory, such as the boss leaving the business under your care while he is gone on a business trip. As a steward, you are to care for, protect and hopefully make a business profit for the boss, exhibiting good qualities of “stewardship” by caring very well for another’s property, the boss’s. Another area where “stewardship” is important is the Public Lands of the State. Merriam Webster defines it pretty well: “the conducting, supervising, or managing of something; especially: the careful and responsible management of something entrusted to one’s care stewardship of natural resources.” That sounds simple enough, right? Well, we need to start off with the question of who is the “steward,” caring and managing for what owner? The Enabling Act of 1875 declared the lands to be the State of Colorado. In the State of Colorado, 35 percent of the state’s public lands are still under the control of the federal government, involving three agencies. Here in Montezuma County, 73 percent of the lands are under the control of federal agencies, which also includes Indian Trust Lands. With that much land and resources under the control of the federal government, it raises the question of the stewardship of the state’s resources. Beginning with statehood in 1876, the federal government acted as the steward for the unappropriated lands of the state, now referred to as “public lands,” while working to dispose of them for the state over the next 100 years. In 1976 the federal government decided to no longer be the steward for the state, but to keep the balance of the unappropriated lands of the state for itself (in violation of the Constitution, by the way). While acting in the stewardship role for the state, the forest and range resources were used to enhance the local economy and improve the watersheds, forage, and forest product conditions. In 1976 the passage of the Federal Lands Planning and Management Act (FLPMA) and the National Forest Management Act (NFMA) eliminated the stewardship role on behalf of the state on the now “public” lands of the state. The reduction in forest stewardship management and use began the deterioration of the overall forest health resulting in overly dense forest growth, disease, insects and fuel buildups, which was reported in the recent 2016 Report on the Health of Colorado’s Forests by the Colorado State Forest Service. The full report can be viewed at The Colorado State Foresters website. The report showed that as of 2015 there were 834 million standing dead trees, and they are being added to daily. That is in addition to the masses of older dead jack straw tree fuels on the ground. The lack of use and management has been reflected in the change in acreages burned from wildfires. The wildfire acreages burned when management and use of the forest was still happening in the 1960s and 1970s averaged 6,000 to 9,000 acres per year. 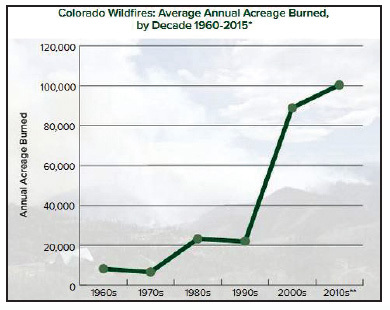 After the 1976 changes in control and management of public lands, wildfire acreage burned shot up in the 1980s to 20,000, then up to 90,000 acres in the 2000s, and up to 100,000 acres in the 2010s, a tenfold increase. This graph shows how the changing impact of good vs. notso- good stewardship of the natural resources has a profound effect on overall forest health. Wildlife numbers are now suffering, with mule deer down nearly 50 percent, according to Colorado Parks and Wildlife. The idea of setting aside large areas to not use stewardship management began in 1964 with the Wilderness Act. Colorado has 14.5 million acres of federal public forest lands, of which 8 million acres (over half) have been designated for no management or use, as designated wilderness or roadless areas, both of which harbor much if not most of the unhealthy forest stands that are critical to the watersheds throughout the state. Houston, we have a problem! Our stabilizer has burned out and we are pummeling through space with no controls or direction and no one seems to care. Over 80 percent of this state’s water originates on those forest lands, where over half have no stewardship activities being conducted. Do we not need and like to drink water and recreate on it and fish in it? Do we not like to hunt game in the forests and range lands? Do we not like to eat a good beef steak or lamb chop and wear leather and wool clothing? Do we not like to go to the lumberyard to buy some 2×4’s for the new deck? Do we not like to hike or ride in a beautiful forest environment? Well, you can have it all if you can have good stewardship planning and management action with local control. There has been lots of fearful rhetoric over federal land transfers recently. Prior to 1976 that issue had never really surfaced much. While the federal control of land was and is, in violation of the Constitution, no one really cared then since the lands were being managed with good stewardship for benefit of the local county and state. So the real issue was not so much “ownership” but “stewardship.” Today, the question is, can good stewardship take place when there is no local control? Probably not, since too many people want the authority to control you, what you can do and your local resources, but want no responsibility for the outcome, or for you and your life. The times they are a-changing, it is a whole new world! So buckle up, Buttercup!